Our 1988, 36’ Monk trawler, Sanctuary, is fit with Dickson stern thrusters. The company is located in California. The website is www.dickson-thruster.com. Sanctuary is fit with Dickson’s two-motor system. The system is hydraulically operated, not electric. The hydraulic system uses commonly available Dexron III Automatic Transmission Fluid. The hydraulic components of the system appear to be manufactured by Eaton Corporation. The hydraulic pump is a light industrial Vickers V20 vane pump mounted on a stringer, off-engine. The hydraulic pump is driven from the propulsion engine’s vibration damper with a pair of 1/2″ vee belts. The propulsion engine is a 150 hp Cummins (4BT3.9M). The engine must be running, of course, to drive the hydraulic pump. The pump is only actually engaged when a control station is calling for thrust. It is engaged by 12VDC electric clutch as commonly found in automotive air conditioning applications. The diameters of the drive pulley and the vibration damper are about the same, so 1:1. Hydraulic pressure is not regulated, so the “operating instructions’ are to run the system with the engine at fast idle, between 1000RPM and 1200RPM. 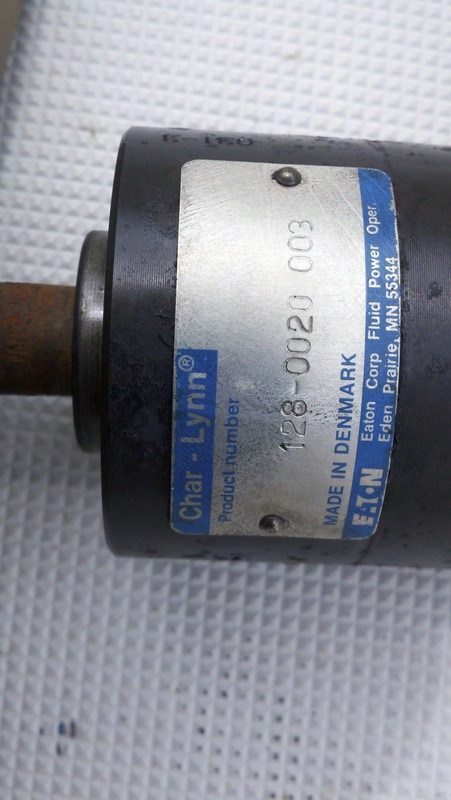 The Char-Lynn hydraulic motors are reversible. The direction of hydraulic fluid flow in the system is controlled by a Baldor Reversing Valve, # K121, which is an electric solenoid-operated shuttle valve. 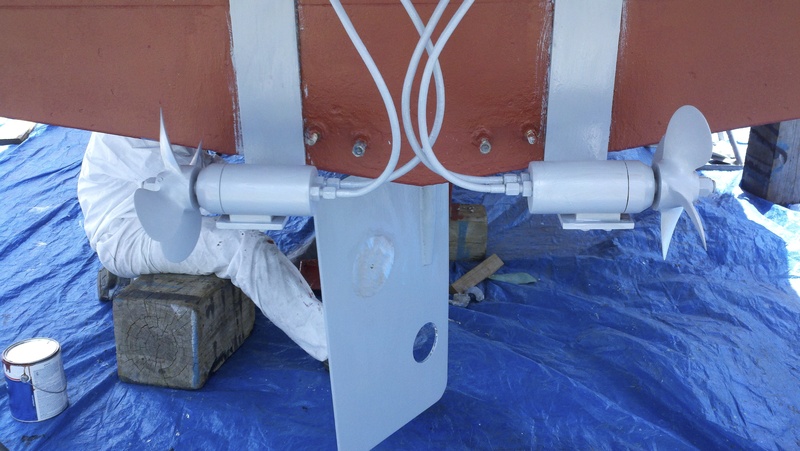 The hydraulic thrust motors are Char-Lynn, J-Series, p/n 1290003, mounted outboard the vessel’s hull on the transom. They operate together, in tandem, to provide either starboard or port thrust. The Char-Lynn motors are mounted in Dickson-proprietary stainless steel housings. They are mounted on transom-mounted SS brackets, and are positioned approximately 12” below the surface of the water. That position is just above the line of the hull as the boat moves through the water. Because they’re out of the flow of water as the hull moves through the water, there is minimal/no drag or turbulence. because the hydraulic motors are reversible, it’s possible after servicing the system to reconnect the hoses so that the motors are not in sync with one another. Reversing the direction-of-rotation of an individual motor can easily be accomplished by reversing the two hydraulic lines to that motor. This can be done at the waterline bulkhead fittings (hydraulic Type JIC thruhull fittings) for individual motors. Reversing the direction-of-rotation of both motor at once can also be done at any convenient place in the system. In reversing the direction of rotation, it’s far easier to reverse the hydraulic lines than to rearrange the control station wiring. The motors provide plenty of thrust to manage the boat in moderate (20-25 kt) wind conditions and/or cross currents. A single motor will manage the boat in settled conditions. Sanctuary’s system has two electrical control stations, one mounted at the salon helm station and one mounted at the flybridge helm station. The electrical design of the control stations would make it easy to add more stations. There are no electronics or circuit boards in the control station; just a DPDT momentary on-off-momentary on switch and a power switch. One side to the DPDT switch activates the hydraulic shuttle valve, and the other side of the switch activates the electric clutch to engage the pump. For an Adobe .pdf file of the wiring diagram of Sanctuary’s thruster control system, click the following link: sanctuary_thruster_system. Figure 3, below, shows the assembly of one of the pair of hydraulic motors. The bronze fitting at the left supports the motor shaft extension. Mechanical support to the motor is provided by the hydraulic fittings as they pass through the 316L SS can at the right. Figure 4. left, shows the end views of the hydraulic motor mounting components. The can (L) supports the hydraulic motor. The bronze fitting (R) supports the propellor shaft and contains a pair of replaceable “X” seals. The bronze shaft support slides into the can and is sealed with an “O” ring. It is held to the hydraulic motor with three Allan-head SS screws. The screws must be sealed with Blue RTV or similar sealant, or “O” rings, to keep sea water out of the can assembly. Figure 5, below, shows the Dickson-Proprietary propeller shaft assembly. This shaft assembly has a flat keyway that engages a 3/16″ x 3/16″ x 1″ square key. The square key is captive in the hydraulic Motor shaft, but IS NOT captive in the propellor shaft. The original design was the that propellor shaft was interference-fit to the motor shaft by the mechanical binding of the keyway. Newer interactions have drilled set screw holes in the propellor shaft collar. In any case, thread locker and SS set screws and SS key material are needed. I have twice had the shaft come apart under load. Replacing the propellor shaft is not a difficult job, but obtaining single-source Dickson-only parts is expensive and time-consuming. Figure 6, below, is the “Type JIC Bulkhead Connector” that serves as the thruhull for the hydraulic lines. In the hydraulics industry, “Type JIC” fittings are the standard. They look like big box store flare fittings, but they ARE NOT compatible with plumbing flare fittings. The fittings used in the Dickson system are all #6 SS fittings. Hydraulic hoses will have to be custom made for each installation. Be sure to use hoses that are certified form marine use by the USCG. I suggest several definite advantages to this system over traditional bow thrusters. First, because it’s mounted outside the hull, access is very easy; an owner/diver can easily clean the props and mounting hardware. There is no bow tube for a diver to have to reach and clean. Second, because it’s stern mounted, space that would be needed for a bow tube is not lost to the chain locker. Third, because it’s hydraulic, there is no large-capacity DC electrical circuitry and battery loads to design, install, charge and manage, and periodic maintenance is minimal. And finally, because there is no bow tube, that structural installation and related costs are avoided. There are three component parts that are single-sourced through Dickson, and are available as replacement parts as of 2/2019. These parts are 1) the propellor shaft extension, 2) the hydraulic motor mounting canister and 3) the canister’s front-piece shaft support. Eaton Corp. hydraulic components for the system are universally available from hydraulics component suppliers who carry Eaton hydraulics products. Component-level servicing is straight forward and possible. The “X” cross section shaft seals are available from McMaster-Carr and from hydraulics shops. Other water seals are standard “O” rings or easily fabricated from rubber stock available in any auto parts store. Overall system capital and installation costs are comparable to the installation of an electric bow thruster; periodic maintenance is less than comparable electric systems. In Sanctuary’s installation, there are two hydraulic thrust motors. Failure of one doesn’t render the entire system inoperative. One thrust motor remains of useful assistance, adequate in settled conditions. 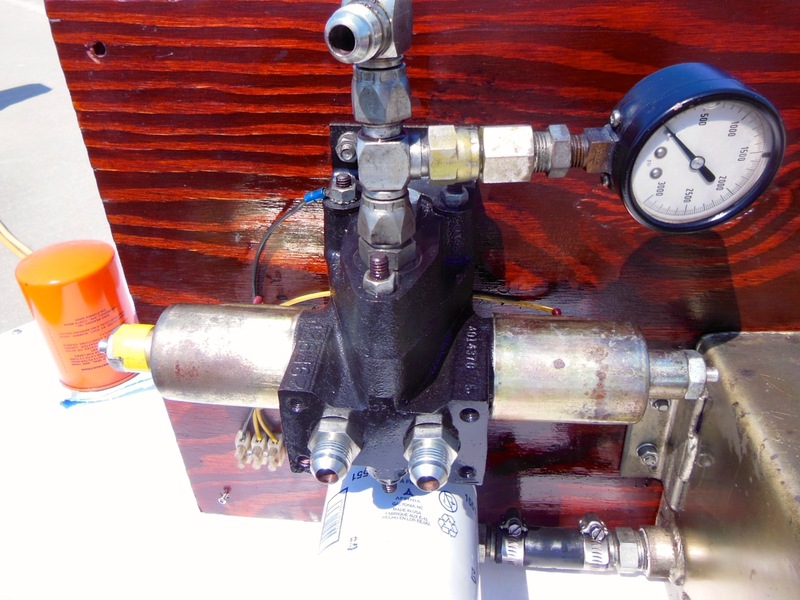 The hydraulic motor assemblies can be DIY removed and serviced while the boat is in the water. We carry spare SS caps for the hydraulic system fittings. The motor assemblies are mounted to their SS mounting brackets with two bolts. From the dinghy, the bolts can be removed and the 15# +/- motor assembly lifted out of the water. The hydraulic lines pass through the hull above the water line, so the hydraulic systems can be capped, and the motor assembly taken to any suitable worksite – shop or picnic table – for repair action. No “special tools” are required. Water seals (“O” rings, quad rings) are off-the-shelf standard items: “quad” rings and flat rubber material which is available in any hydraulics shop or from Internet sources. I find maneuvering the boat with stern thrusters is superb. I place the bow where I want it, and get close enough so our deck crew can reach a cleat, bollard, piling, bull-rail, whatever. Once the bow line is attached, we cinch it on the deck and swing the stern in. Managing the boat in the Great Loop’s many lock configurations was quite easy. We simply tied a breast line to the bollard/cable, and used the stern thruster to stay parallel on the wall. Backing the boat – even with Sanctuary’s undersized OEM rudder – is easy. We usually have docking assistance when we arrive at a day’s destination in the afternoon/evening. We often depart in the morning before dock assistants are available. We prefer to bow-in to slips, which maximizes our vessel control options during unassisted departure. This entry was posted in Dickson Stern Thruster System, Equipment Topics on 2013/01/12 by gilwellbear.